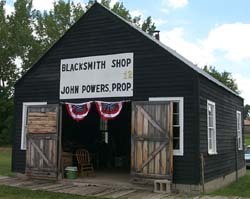 A short time after Annandale's incorporation in 1886, John Powers moved his blacksmith shop there from Rockford. Many of the tools here came from that business, which was in operation until 1970. The Crown Iron Works in Minneapolis provided other tools. 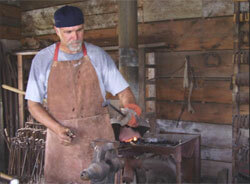 The blacksmith was of great importance to a pioneer community because he made everything from gun springs to plows. The walls and workbench are covered with tools and implements made by the blacksmith. He repaired all kinds of machinery, and made parts for sleds and buggies. He shoed the horses, with regular shoes in the fair weather and pronged, non-slip shoes for the winter. Shown in the rear of the shop are dozens of different horseshoes. The forge was constantly blazing, stoked with hard woods like oak and ash, and fed with oxygen from the bellows for hotter burning. The blacksmith wore a heavy apron to protect himself from the heat and sparks. The anvil was the center of the shop. It was there that the red-hot iron bars were formed and pounded with the hammer, which usually weighed 9 pounds. It is no wonder that the village blacksmith usually won an arm wrestling competition!